Representatives from the Chicago Cook Workforce Partnership (the Partnership) have been meeting at the various Treasure Island Foods store locations to share resources and support the staff members displaced by the company’s recent closing. A meeting for Hyde Park location employees is currently being planned at the Mid-South American Job Center at 4314 S. Cottage Grove Avenue. For more information, contact the center staff at 773-538-5627. In addition to providing employment support, individuals who meet eligibility requirements can work with the Partnership to secure supportive services such as healthcare, childcare, or additional training. Services are available to former Treasure Island staff members and all residents of Cook County. 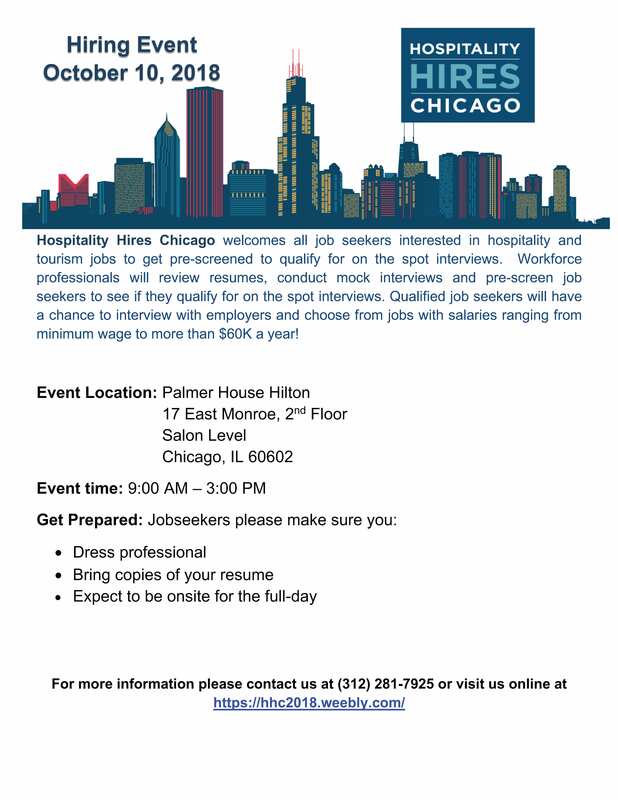 The Partnership is hosting a pre-screening/hiring event tomorrow (Wednesday, October 10, 2018) through Hospitality Hires Chicago for job seekers interested in hospitality, retail, and tourism positions. The event takes place at the Palmer House Hilton on the Salon Level at 17 E. Monroe Street from 9 a.m. to 3 p.m. Attendees are encouraged to dress professionally, bring copies of their resume, and expect to be on-site for the entire day. The Partnership staff will review resumes and pre-screen job seekers to qualify for on the spot interviews. Qualified job seekers will have a chance to interview with employers for jobs with salaries ranging from minimum wage to more than $60k per year. The Department of Commerce hosts a web portal called Illinois workNet Center that has a Layoff Assistance Guide with information about unemployment insurance, health insurance, and supportive services in addition to how-to resume guides and tips for networking, job searching, and interviewing. You can access the guide here. UChicago Local also works with a variety of nonprofits who provide job placement services, including the list below. This list is not inclusive of all workforce programming, but includes local agencies that provide comprehensive support.